I have had the most relaxing, girlified weekend! On Saturday morning I finally went and redeemed my birthday voucher for a spa treatment - so nice! - and then came home and had a small, relaxed afternoon tea, complete with scones and champagne. A welcome indulgence after a busy week of work. 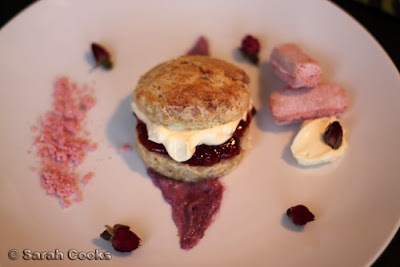 This afternoon tea came about from a rather fortuitous combination of events: I had buttermilk leftover from the Edward Cullen cupcakes, and a tub of cream leftover from a mid-week dessert of apple and raspberry cobbler (blog post to come!). Throughout the week I was thinking of how to use them up - scones or buttermilk pancakes? 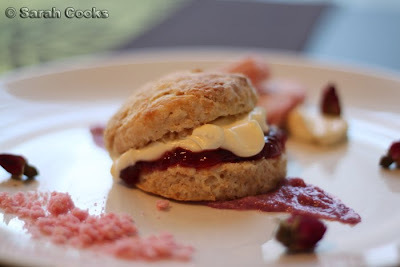 Then I saw this post at Catty's blog, and I knew that scones were the answer. 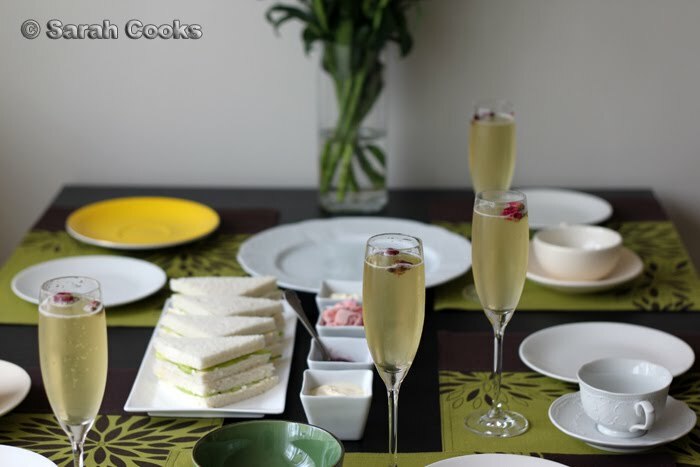 Yes, scones and green tea champagne cocktails! Thinking it might not be wise to have a whole batch of scones to myself, I emailed a couple of friends on Friday, and bang - it became a tea party! Exciting times. It was all I could do not to turn a casual afternoon tea of scones into one of our usual Cecil B. DeMille productions. Although having said that, I did whip up some cucumber sandwiches too! 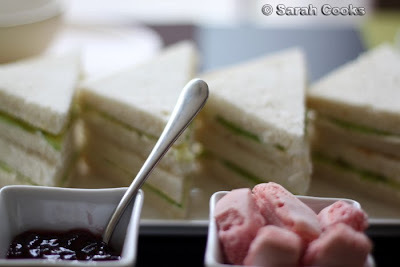 I got home from the spa treatment around midday, and relaxedly went about preparing the afternoon tea. We started by setting the table. We don't have a full tea set (and who does, these days? 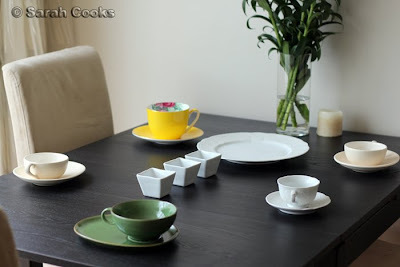 ), so we put together what I hope was a cheerfully eclectic mix of a bunch of different teacups and plates. Anti-clockwise from top left: giant yellow T2 cup, Nigella cappuccino mug, green soup mug from Ikea, Bistro Vue teacup and saucer, Nigella cappuccino mug. You'll see in the other photos that we put placemats under the cups, and that's because the Bistro Vue teacups scratched our table. Damn cheap Ikea tables! Hehehe. 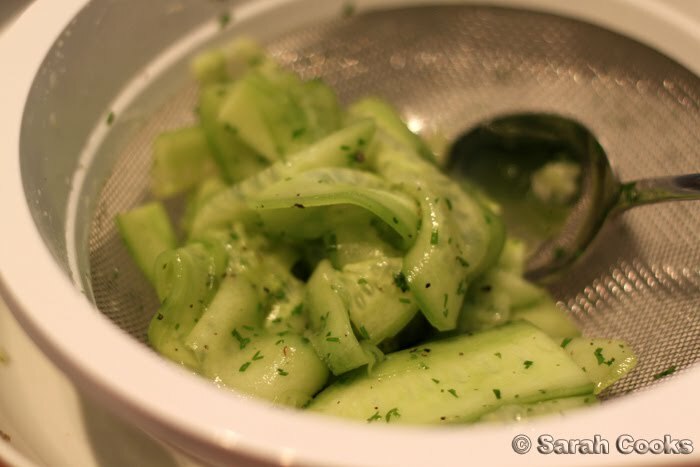 The first thing I prepared was the cucumber for the cucumber sandwiches, as they need a couple of hours marinating. I adapted the recipe from a few sources, with the taste of a Germanic cucumber salad. I mixed together with 1 tbs white wine vinegar, a good amount of chopped dill, 1 tsp salt, 1 tsp castor sugar, and a good sprinkling of pepper. I added 2 peeled and thinly sliced cucumbers to this mixture, and let it sit while I got on with the scones. Cucumber - draining after its marinading time. Then I started making the scones. I made the dough and cut out the scones, and set them aside, only putting them in the oven after my friends arrived. I used Belinda Jeffrey's recipe for fluffy buttermilk scones, from Mix & Bake. 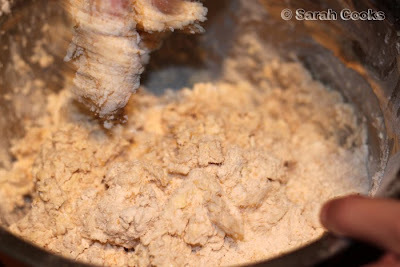 Interestingly, she uses half wholemeal, half plain flour, for a heartier texture and flavour. It smells great when the tangy buttermilk hits the nutty wholemeal flour! Just before my friends arrived, I put the sandwiches together. I used very fluffy white bread, cut off the crusts, and spread them with butter and cream cheese (both softened in the microwave to avoid tearing the soft bread). Then I added the drained cucumber, and cut them into pointy little triangles! At first, I was a bit "meh" about the sandwiches, but they really grow on you. 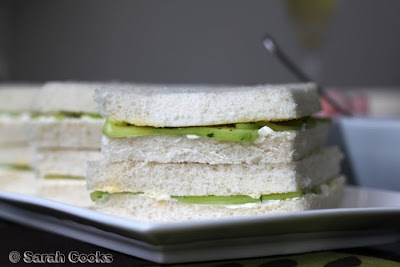 The strong, almost pickled flavour of the cucumbers was tempered by the bland sour cream and white bread. I will definitely be making them again. Not great, but still an improvement on my last efforts. They did taste good though, and I think of them as the sensible, country sister to Chef Markus glitzy city scones. 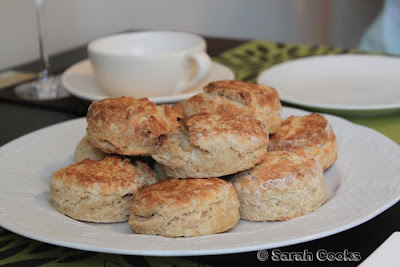 The search for a perfect scone recipe continues. Oh yes, and I did say there were champagne cocktails, didn't I? Inspired by these prosecco & green tea cocktails, we brewed some green tea (Suntory brand, from my bro in Japan), let it cool, and topped it with champagne. (Technically French sparkling wine, because it's from France, but not the Champagne region). I chucked in a couple of dried rosebuds for extra girly prettiness! You'll see in the top photo that we only have 4 champagne glasses, so shhh... I had mine in the giant yellow tea-cup! FYI - I've seen small containers of rosebuds sold exorbitant prices at gourmet stores, but you can get them super-cheap at Asian groceries! 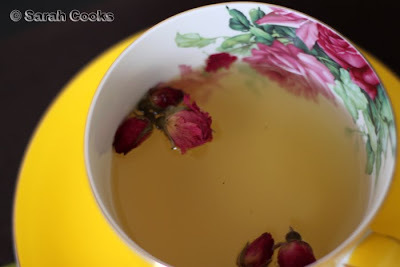 They're actually really fragrant, and you can make rose tea with them as well. I enjoyed the subtle hint of rose aroma they gave the cocktails. And playing (unintentionally) on the roses & champagne theme... we also opened up a box of biscuit roses de reims that my friend Clarice sent me as a gift from Paris. These biscuits go terribly well with Champagne, darling. They're like little rose-flavoured savoiardi biscuits, and I have used them successfully in tiramisu-style desserts before. Ling totally outdid herself and brought soufflés! (Yes, soufflés!!!) She brought them, uncooked and gladwrapped in their ramekins, and we popped them in the oven after we'd eaten scones. Woah! Look how high they rose! The vibrant purple colour is thanks to the blueberry and rhubarb inside. She also made an oaty nutty crumble to sprinkle on top. We have some of that crumble leftover, so I'll be sprinkling it on my yoghurt this week! 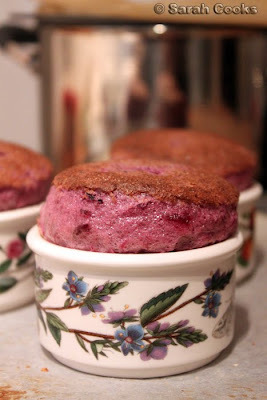 The soufflés were really delicious, and nice and tangy from the fruit. 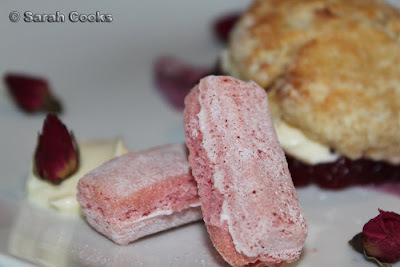 They tasted great with a dollop of double cream too! Thank-you Ling!! And after that... I don't know if it was the sugar or the alcohol, but we started playing with our food, plating it like a fancy Scott Pickett-style dessert. Stripe of rhubarb-blueberry souffle in the middle, topped with scone. Around you can see the biscuits roses de Reims, both whole and crushed, a quenelle of cream (well, we tried! ), and some rosebuds. It's cool how everything we ate happened to fit in the same colour scheme, hehehe. 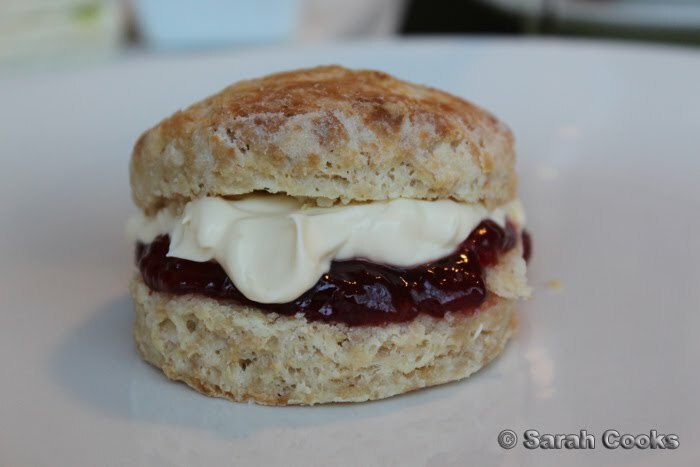 But despite all that fanciness on the plate, all I really want is a good old-fashioned scone! 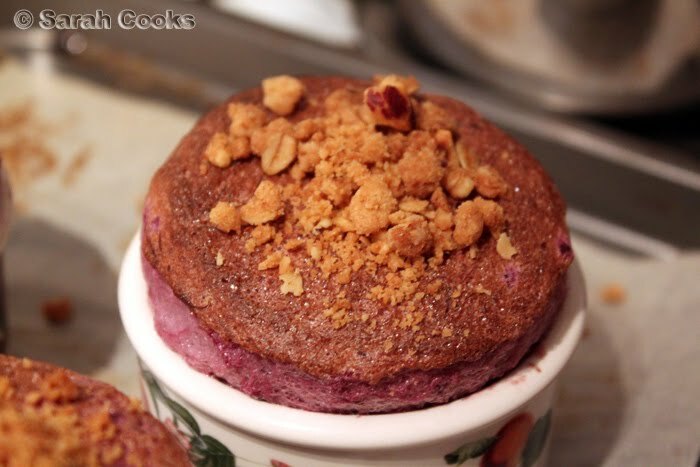 blueberry and rhubarb souffles??? I want your friends!! :) great "just thrown together" tea party, Sarah! The devonshire tea was marvelous Sarah! The sandwich makes an Excellent snack in between meals. The flowers you had on the table was beautiful too, pity I don't see a full shot hehe. It was a lovely arvo, thanks for having us :-D (And the tip on where to buy rose buds). You have tea cups? I have none... coffee cups yes. Brilliant! And yes, I would have just like a scone as well. Excellent tea party Sarah. Thanks for the invite. Loved those cucumber sandwiches. 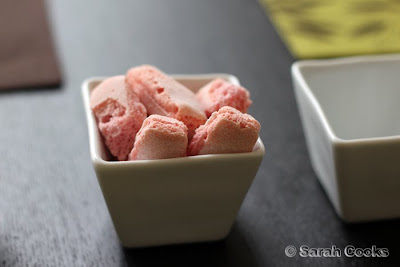 I must make them soon. Very, very pretty! Good tip on the roses too - I'll have to keep an eye out for them. Good tip about the roses - I'll have to keep an eye out for them. The pictures look amazing - I love scones with cream and jam. It's been too long since I last had them. I think I need to find a tea room at the weekend! I tried making scones this afternoon and mine turned out a bit too flat as well. Think I rolled it too flat and no idea how high it will rise. Best scone tip ever: on the pan bunch all the scones together all up one end, so they are all touching one and other; then they will all rise together and push each other up, they will stick together a little bit but you can just break them apart (like hot cross buns); this works well for bread rolls as well. If you space them out like biscuits then biscuit shapes scones you will get!! Are the green Ikea soup mugs discontinued?